Mail Casino will then reward you with a bonus (Welcome Bonus is for new players only). The terms and conditions of the bonuses vary between different casinos and might also change over time and between different countries, so it is important to compare the different offers and read the T&C for Mail Casino before signing up. 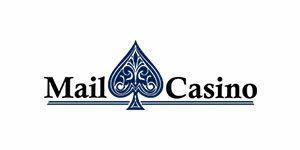 Progress Play launched Mail Casino in 2017 and assigned it a logo with a big ornate spade. Classy, no doubt about that, but what games does this venue offer? All sorts of games, as a matter of fact. 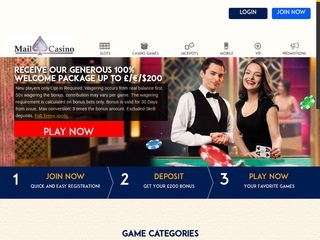 Mail Casino houses a mixed selection of slots, table and live casino entertainment which comes from prestigious developer brands and proven software producers. Mail Casino is mobile ready and even supports payment methods that include mobile transactions. The website layout is straightforward and easy to use, very suitable for mobile enthusiasts who spend their free time gaming. For starters, Mail Casino has organised the games into groups like Slots, Casino Games and Jackpots, so that players can reach their desired sectors faster and easier. The brand holds a UK Gambling Commission license and its offering are proven to be 100% safe. A tempting 100% cash match package on the first deposit up to $€£200 is how Mail Casino says welcome to all its new members, offering them constant promotions on specific days of the week. Mail Casino is available in English only, and active on social media – Facebook, Twitter and YouTube. Since its operator is registered in Malta, Mail Casino also owns a license by the Malta Gaming Authority. The site utilises the latest 128-bit Secure Socket Layer (SSL) encryption and firewall technology and employs knowledgeable customer support agents. The 2017 Progress Play product counts on 400+ games which come from reliable software providers. The games load without delay on mobile and desktop platforms and the users face a vast collection of slots above all. This stellar library is expanded by sections with table games, and jackpots. From new games to top games, Mail Casino brings out the best of a multitude of software suppliers and manufacturers. Some of the main providers are certainly Microgaming, NetEnt and NextGen Gaming, filling up the pages of Mail Casino with their finest creations. No matter your taste in slots, chances are you will find what you seek in Mail Casino’s library. It may be a bit tricky to find all the traditional 3-reel slots as there is no separate section with them on site, but the collection of video slots is very much visible from every angle. You can take your pick according to the themes – Irish, fantasy, Norse mythology, adventure or branded machines. Some of them are more popular than others, like Starburst, Thunderstruck II, Wolf Cub, Twin Spin Deluxe, Toki Time and Game of Thrones. Jackpot slots list include titles such as King Cashalot, Treasure Nile, Fruit Fiesta, Divine Fortune and Dolphin’s Gold Stellar Jackpots. The current total of all progressives is over 15 million! Table games are the other side of online gaming, an alternative way of satisfying one’s gambling needs. Whoever likes playing card games more than spinning reels should visit the Table Games selection at Mail Casino. There, you can find quite a few modalities of blackjack and all the known versions of online roulette. Spanish 21 Blackjack Gold, Vegas Strip Blackjack, Premier Roulette and European Roulette are some of the titles on display. Mail Casino does not offer any virtual poker games. Instead, it offers a limited selection of video poker machines: Double Bonus Poker, Louisiana Double, Aces and Eights Poker, Jacks or Better and Deuces Wild Poker. Scratch cards are on offer, mostly the all-time favourites (Irish Eyes, Doctor Love, Foxin’ Wins). Mail Casino customers can also play keno and Germinator, Six Shooter Looter and Dawn of the Bread. If roulette, blackjack and baccarat are your preferred table games, Mail Casino offers a new way to play them – with live dealers from the comfort of your home. Live dealer renditions of popular games like 21 and roulette introduced a new era of live casino gaming, joined by Mail Casino with such titles like Live Baccarat, Live Sizzling Hot Roulette, Live Blackjack Standard High Roller, Blackjack Common Draw and Classic Roulette. The sessions are played in a live environment, covered by cameras and managed by lovely dealers that players can interact with. Pragmatic Play always enables its sites to provide convenient banking services. Mail Casino accepts all kinds of credit and debit cards, even Solo, Switch and Diners. UK customers can pay fund their accounts via phone bills (but they need to pay a 15% processing fee), and the casino also supports deposits made with Paysafecard, Trustly, EcoPayz, Neteller, Skrill (former Moneybookers), iDeal, Sofort, Webmoney and Qiwi, among others. The smallest amount for a deposit is £/€/$ 20. When it comes to cashing out, most of the mentioned methods apply. Withdrawals carry a fixed fee and involve a pending period of 3 business days. If there is anything you need from the customer support – an explanation, guidance, help with redeeming a bonus or anything similar – you can contact Mail Casino support agent via email or live chat. There are no office hours and you can make contact at any time of day or night. Of course, the Live Help option is instantaneous, while an email response may take several hours.